Your First Treatment Your first visit to Acupuncture Pain Management will begin much like any other medical appointment. When you first arrive, you will be greeted by our friendly staff and then handed your First Visit Package. This package contains several forms asking you to respond to a number of questions, ranging from your full name to the type of condition you are experiencing. (We understand that many of these questions may seem repetitive – we know you have probably answered most of them at every other medical office you’ve been to – but please understand that we need to gather this information to build an accurate treatment chart for you.) After you have filled out your paperwork, you will be invited into one of our treatment rooms, where you and your acupuncturist will discuss your medical history and your chief complaints. 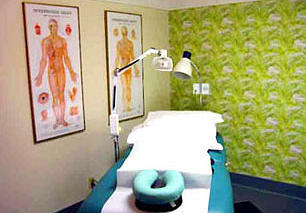 Our treatment rooms are spacious and warmly decorated so that you will feel comfortable and relaxed. To help you let go of stress and anxiety, we always have soothing instrumental music playing in the background. We have orthopedic aids and pillows to ensure you are positioned properly and comfortably during treatment. 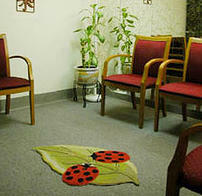 There is even a chair available for a curious or supportive guest to be present during your treatment, if you so wish. Depending on the type of treatment you require, your acupuncturist may ask you to disrobe completely, or to simply roll up your sleeves; in any case, you will be given a disposable gown to safeguard your privacy. You may be asked to lay face down, face up or sideways on the treatment table. Your acupuncturist will then gently insert the acupuncture needles in the points that will benefit you the most and, when he or she is sure that you are comfortable and relaxed, will leave the room, but not before dimming the lights and turning the music up a bit. The needles will be left in anywhere from fifteen to forty minutes, and when time is up the acupuncturist will return to remove and dispose of them. Do not be surprised to discover that you fell asleep during treatment; it happens all the time and some people even snore loudly! After the acupuncture treatment is completed, your acupuncturist may decide that you will benefit from other TCM treatment techniques, and will proceed to administer them as needed. Then the two of you will discuss other ways in which you can help yourself maintain your own health, such as nutritional advice, exercise routines, and even relaxation techniques. Remember, our concern is your health and well-being, and we will advise you in every way we can so that you can begin your journey to better health. ​We’re willing to bet that after the first treatment, you will fall in love with acupuncture and you will want to come back again and again! Your acupuncturist will let you know when he or she would like to see you again (some patients need treatment 2-3 times per week, while others do fine with a monthly “tune-up.”) Our friendly staff will be ready to help you book your next appointment. When you are back for a new appointment, things will be much simpler than on the first day. Your acupuncturist will ask you some questions about how you are feeling, but don’t expect to fill out any more paperwork than an occasional progress report (it is really simple, we promise). Your treatment will then continue with your comfort and health in mind. Don’t forget that your input is always welcome; if there is some aspect about your treatment that you found particularly helpful please let us know. Thank you for giving us the opportunity to help guide your journey to better health! About Nancy K. Brigden, L.Ac.